Looking at this beautiful chapel ? can you imagine that each of its parts ? floor, walls, altars, sculptures, even the lamps are made of different kinds of salt? This is St. Kinga’s chapel in the Wieliczka Salt Mine. Do you know how the salt deposits were discovered? There is a famous Polish legend about it: when Prince Bolesław Wstydliwy was the ruler of Poland, he decided to ask the princess of Hungary, Kinga, to marry him. Kinga’s father wanted to give her gold and jewels as a dowry, but Kinga decided that was not a good gift for a Polish king who was already wealthy. The princess asked her father to give them salt, and, wanting to meet her request, he took her to a mine in the Maramures region and said: ?You have what you asked, here are rich salt deposits?. The King was concerned because he did not know how to move all the salt to Poland. But Kinga lifted her eyes, asking God for advice, and after a while she knew what to do. She removed her engagement ring from Boleslaw and threw it into the shaft of the mine. Courtiers who saw it were a little surprised, but they said nothing. Soon, the wedding took place and all the knights and nobles of the Małopolska attended. After several days, seeking to find her dowry, she asked her husband to show her the kingdom. So the whole procession came, and the King admired the beautiful lands of his principality. Suddenly Kinga asked to stop and directed her servants to dig in the ground. When the attendants came upon a rock, they said that further digging is impossible. One of the peasants gave Kinga a piece of white rock, which was a lump of salt. She ordered the lump to be split and her engagement ring fell out. Then everyone understood what dowry father had given her and that the ring, which she threw into the mine in Marumures, had brought precious salt to Poland. 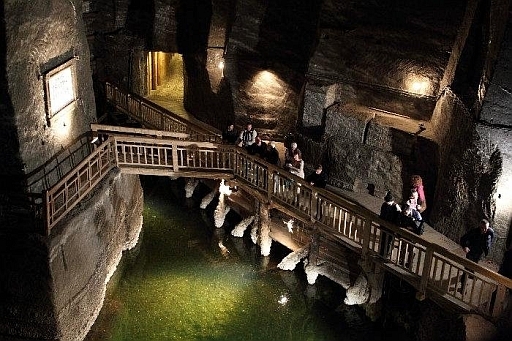 Since then, the mine in Wieliczka has been famous for its rich salt deposits. 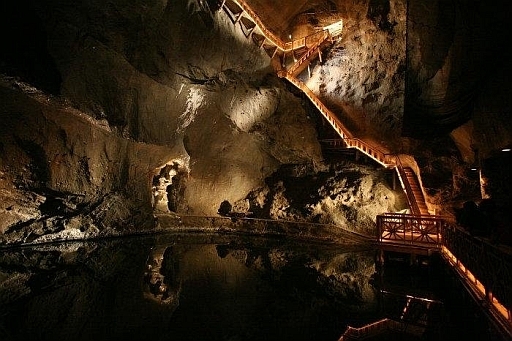 Wieliczka salt mine has been producing table salt since the 13th century. 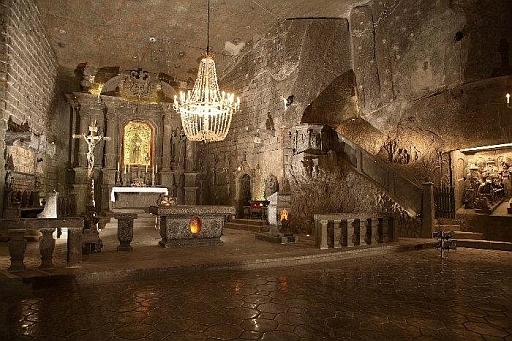 It was one of the world’s oldest operating salt mines (the oldest being in Bochnia, Poland, 17 miles from Wieliczka). The mine reaches down to a depth of 327 meters (1073 feet), and is over 300 km (186 miles) long. The Wieliczka salt mine features a 3.5-kilometers (1.8 mile) tourist route (less than 1% of the length of the mine’s passages) that includes statues of historic and mythic figures, all sculpted by miners out of the rock salt. Even the crystals in the chandeliers are fashioned of salt. In 1978 the Wieliczka salt mine was placed on the original UNESCO roster of World Heritage Sites.